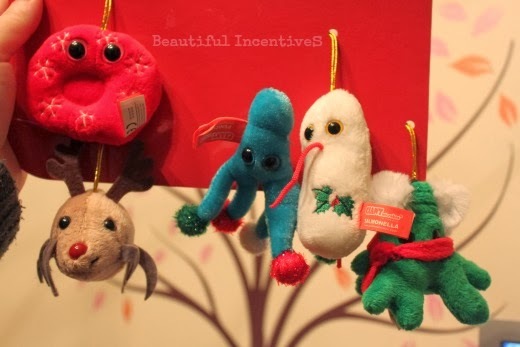 Beautiful Incentives: Giant Microbes is back! #Holidaydeals #geeky #Giveaway ! Giant Microbes is back! #Holidaydeals #geeky #Giveaway ! This post was inspired by Giant Microbes. I received product free for evaluation. All opinions are my own. I love this company and the unique products they offer! 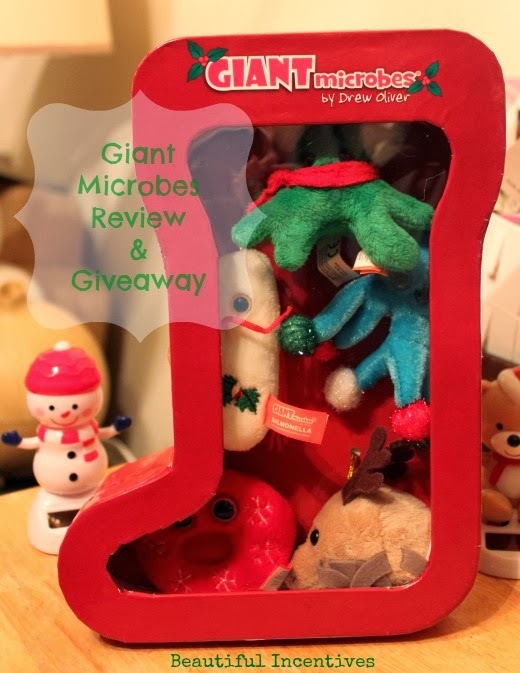 If you've never heard of them, see my first Giant Microbes review here and read on! I have partnered up with Giant Microbes to give you another awesome giveaway this year and I'm excited to share their Christmas line and the new line of computer virus's! I never thought a computer virus could be so cute! Giant microbes is the cutest twist in science and art I have seen in a long time. They make science fun to learn for kids and they are just as entertaining to adults. 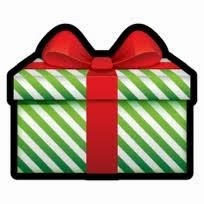 Especially for gift giving. It's the only time you want a virus and you want it bad! First up is the Christmas collection . These are their most popular microbes in ornament form. It comes in this adorable Giant Microbes Christmas stocking box and all the microbes are decked out in winter and holiday clothing. Each microbe is tagged with it's scientific name as seen on the Salmonella in the pictures. It really doesn't get cuter than that does it? They're all so adorable in their winter wear Christmas decorations. I don't know any science geek or little budding one that wouldn't want these adorning their tree or perhaps a Chemis-tree?! I saw one of those recently. You have to love a good play on words you can put into action and get creative with. Second up are the NEW Computer virus's. Ok, I lied. It does get cuter. Something that has been the product of fear and annoyance of so many is now finally in a cute stuffed form that we can laugh at. Computer virus are now going to be coveted by all and this is something that children will love. Utilizing these to help teach kids about computer virus's makes for much more fun science education. I think my favorite of these is the key chain of the Trojan which looks like it has an awesome futuristic mohawk going on. These are so creative and neat looking. Toting this around on my key chain is going to make for interesting conversation. Designed using the 1’s and 0’s of binary code! Computer Virus Dolls come packaged with a “pop-up” hang tag just like the pop-up warning you get on your computer screen when you get a real virus. Computer Virus Dolls include an extra long sewn-in label with their names spelled out in binary code. Both the Dolls and Key Chains come with educational information about each virus that they represent. 4 Viruses are available now: Malware, Trojan, Worm, and Virus. To learn more, follow their social media and keep up with promotions! 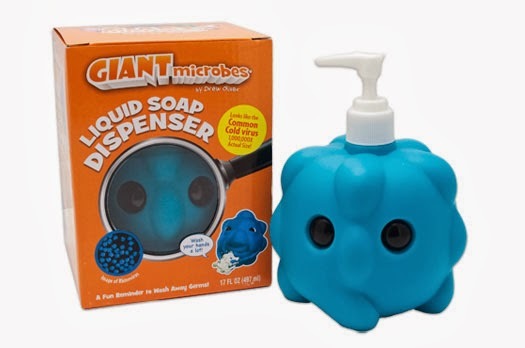 They also offer other things that are pretty neat, like this microbe soap dispenser in the form of the common cold. How cute would that be for your kids? And now it's time for the giveaway! I'm so excited to be able to offer 1 lucky winner a Christmas box of their choice: stocking, tree, or ornament. 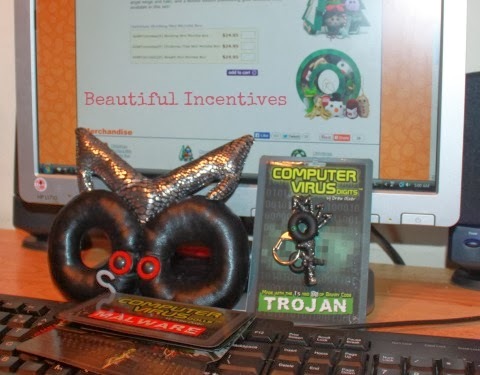 And another lucky winner will receive their choice of any stuffed computer virus or key chain! I love these!! I remember the last time you had them - I want that little blueish one, he''s neat!! I like the little stuffies! The salmonella is my favorite since I want to do a grad program in microbiology. 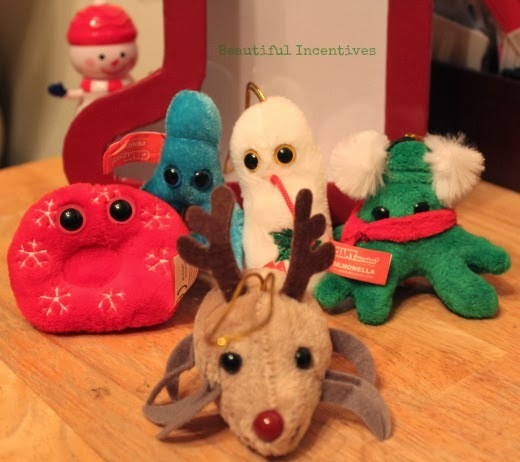 I love the GIANTmicrobes(R) Christmas Tree Mini Microbe Box!